Hershey Park (more info.) Hershey, PA. Hershey Park is one of the most popular Pennsylvania Attractions. What a sweet treat! The Hershey theme park features roller coasters and water rides and more fun than you can shake a candy bar at. Hershey Lodging choices are extensive, but reccommended to book early. Some offer special Hershey Park passes and seasonal shuttle service to the park. The PA Grand Canyon is certainly one of the state's best kept vacation secrets. Perfect for couples or families or friends reuniting, to share adventure, scenery and relaxation. Visit the Pennsylvania Grand Canyon. 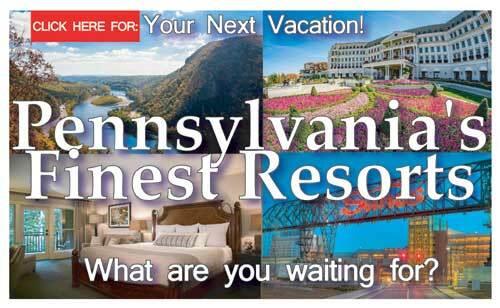 Head to the Mountains and enjoy one of Pennsylvania's most beautiful vacation destinations. Want to escape the city, breath some fresh mountain air and enjoy some picturesque scenery? Then the Pennsylvania Grand Canyon is your next vacation destination. A great getaway for couples, families and friends. Hiking, Biking, Boating and just plain relaxing. Not everyone wants to spend their vacation with a crowd. Hike, Bike or Boat in the Pine Creek Gorge, aka the PA Grand Canyon. The Pine Creek Rail Trail provides over 60 miles of bicycling and hiking on one of the most scenic trails in the US. 3830 Dorney Park Road Allentown, PA One of PA's most popular theme parks. With wild and tame rides, Dorney Park is sure to entertain the whole gang. Get ready to have a blast and find out why Dorney Park is one of the Top PA Attractions. The Pennsylvania Pocono Mountains, another popular PA vacation destination, with great Resorts and Restaurants, you'll find outdoor adventures from water sports to Golfing and Skiing. You'll soon discover why the Pennsylvania Mountains are a top attraction. Music festivals, museums, theatre and art, all in the Pennsylvania Pocono Mountains. 160 North Gulph Road King of Prussia, PA, Pennsylvania's shoppers paradise. With hundreds of stores to shop at, you'll find it difficult to cover it all. And it's more than just shopping, it's eating too. Be prepared to have some great food and some great fun at the King of Prussia Shopping Mall. Philadelphia Pennsylvania, one of the most visited tourist attractions in Northeast US. Steeped in an historic past, it stands as a most crucial part of our nations development. From the Liberty Bell to Independence Hall, visitors can enjoy museums, tours and countless historic sites. There is so much to experience in Philly. great Restaurants and Hotels, entertainment, music and theatre... and don't forget the cheese steaks! Lancaster County, PA. With a great fascination for the culture and color of the Amish country, visitors find a way home to a simpler life. On this vacation you can step back in time and discover a part of our culture with centuries old traditions, from horse drawn buggies to hand hewn architecture, in The Lancaster Amish Country. 100 Sesame Road Langhorne, PA Your Kids will Love this! And so will you... A world full of Sesame Street characters come to life. Sesame Place will spark a child's imagination and take you back to your own childhood. Be a part of the whole Sesame gang. Enjoy a gigantic water slide or take a roller coaster ride. 4800 Kennywood Boulevard West Mifflin, PA Kennywood, another great place for fun in PA. The park is an historic Pennsylvania landmark, a family friendly experience that you will want to return to time and again. Kennywood park is considered to be one of the best traditional amusement parks in the nation. Erie, Crawford, Mercer, and Venango County PA Come visit the Woods by the Sea, and enjoy a vacation at the PA Great Lakes. Spend time at Lake Erie and miles of beaches that have sustained popularity as a top PA attraction. Vacationers will find water parks and amusement parks, and outstanding natural beauty.